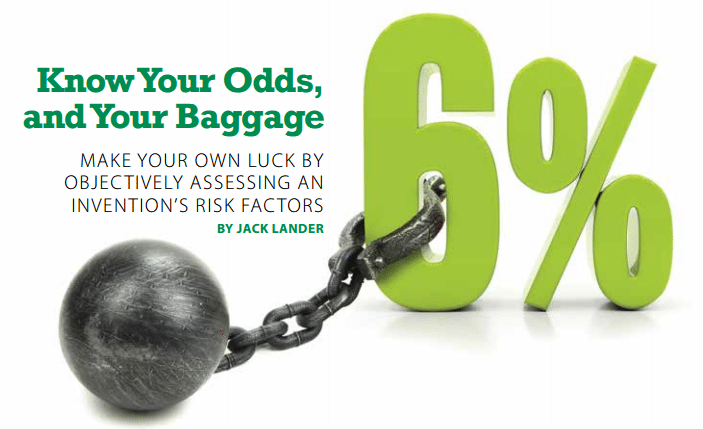 Make your own luck by objectively assessing invention risk factors. I recall a very successful TV pitchman saying that one of his secrets for success was practicing his sincerity. I hope he was joking, because his statement is self-contradictory. You’re either inherently and spontaneously sincere, or you’re not sincere at all. his skill in controlling those aspects of the game that don’t depend on the cards he is dealt that determine his long-range success. One reason that success eludes us is that we inventors tend to dream up solutions to annoyances, problems or needs that we stumble upon. That’s certainly one valid approach to inventing. the invention’s baggage in order to decide whether to further pursue our solution. for their success will most likely fit the 6 percent statistics. A realistic perspective is essential to success because, as those odds suggest, it usually takes several tries before we hit the jackpot, and we can’t afford to be devastated by our failures. Winston Churchill said that the secret to his success was going from one failure to another without losing his enthusiasm. quest: the baggage it comes with, and the remainder, which we can control. • How the annoyance, problem or need was solved or handled in the immediate past. • The number of persons or businesses presently encountering the annoyance, problem or need. 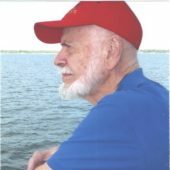 • The prior art that determines if you will be violating an existing patent—and if not, if you can get a meaningful patent. The baggage is what it is. We don’t determine it; we work with it, and around it. and the annoyance and the need. But how did people solve the label residue problem before? One household hint was to apply a bit of cooking oil with a paper towel, and rub like heck. But no commercial product existed. Good news so far. Then, you estimate the number of times your family has removed labels in the past year—at least five times. And your Google search tells you that there are about 116 million U.S. households. That’s got to be a market of nearly 600 million. Even allowing for excessive optimism and big errors, there’s still a huge market. an unusual additive to water that somehow removes the sticky residue. Your patent attorney tells you that she thinks she can get you a strong patent. You proceed to develop and prototype your invention. And you’re wondering whether to quit your day job and devote full time to this sensational opportunity. generally known. The licensee can also advertise to stimulate early demand, but that’s a luxury that most small startups can’t afford. sales may take years to reach a satisfying level. Let’s say you decide to market through a large chain like Kmart. You meet the buyer, he/she tells you that there is no demand for such a product, and his company is not in the business of gambling on products that don’t have a sales history. You scratch your head and ask yourself how the market for any product ever gets its start. competitive product flow to carry you along, you may have to abandon your quest. Then you remember an Inventors Digest article on selling to catalogs, and how catalogs thrive on novel products that are not sold in stores. Your quest is saved! wisdom of taking such actions before you devote a lot of effort to the fun part: developing your invention. Go forth and invent. Stumble onto your opportunities, if that’s your style. But don’t lose sight of the typical odds of success and the baggage that you must deal with upfront.